We all know of the Canary Islands. Almost everyone has holidayed in Tenerife, Gran Canaria, or Lanzarote. These destinations are ideal for spending a week or two in guaranteed sunshine. 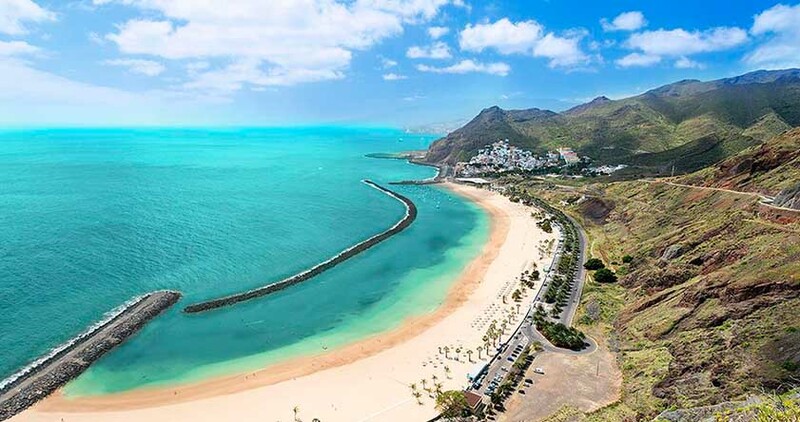 But if you’re looking for a little more natural beauty, why not try the hidden gems of the Canary Islands? here Reserve. The skies are clear, and the island’s strict light pollution laws mean that it’s a fantastic destination for star-gazing, so much so that it has earned a Starlight award. Plenty of guided night tours will get you discovering it for yourself. There are 1,000km of hiking trails, making the island a paradise for outdoorsy types. Alternatively, stay close to shore and find yourself on Puerto Naos, the famous black sand beach. For a mixture of shopping and culture, head to Santa Cruz de La Palma. The area is vastly unchanged from colonial times, making visitors feel as though they’ve stepped into the past. Getting around is easy by car or by bus. If you plan of using the bus often, buy a Bono Bus discount card (starting at 12EUR) for up to 20% off individual fares. The island is accessible by regular flights from major European airports, or by boat from Los Cristianos, Tenerife. Onto the next of our hidden gems: La Gomera. Natural and magical, this little island is another UNESCO World Biosphere Reserve due to its pristine ecosystems. From above, the island looks like the fortress of some evil genius—but no such evil is found here. Lush valleys and verdant forests define this island, home to many species that cannot be found anywhere else in the world. Another one for the hikers, you’ll find 650km of trails. 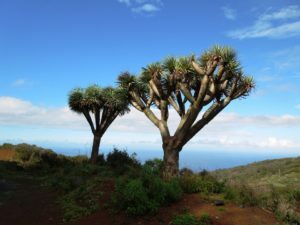 La Gomera’s native laurel forest in Garajonay National Park once covered the tropics and survives today only in La Gomera. Once you’ve had your fill, soak up the views of black sand beaches, palm trees, and tiny white houses in the Valle Gran Rey. Don’t forget Los Roques Viewpoint, either—superb views from five rocks formed of volcanic magma that never quite reached the surface! La Gomera is easily reached by air or sea. A comprehensive bus network covers the island, though book ahead if you’d like to rent a car. Several daily ferries run to and from the island, and you can reach Los Cristianos in as little as forty minutes. 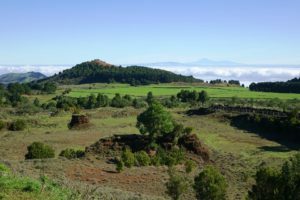 Hidden gems may be our focus, but never did we imagine finding something as special as El Hierro. This stunning island, still known as the Meridian Isle, is quite unique, and the first island in the world to be 100% self-sufficient using only renewable energy. Free Wi-Fi spans the island, meaning you can instantly share stunning pictures with loved ones. Furthermore, given its UNESCO World Biosphere Reserve status, you’ll want to take plenty of pictures. Beginning with La Restinga marine reserve, a dream diving site, you’ll see a vast array of marine life and volcanic features. Take a trip up to La Pena viewpoint, offering superb views and a restaurant with traditional Canarian fare. Check out the Garoe Tree, a site sacred to the island’s indigenous people. A staple is Frontera National Park, with its iconic twisted junipers. And don’t miss out on the Charco Azul—this natural seawater pool is nothing short of enchanting. The island has a small airport, and the port sees one ferry per day. Buses do a great job of covering the island. Weather is moderate most of the year, with temperatures reaching high 20s in summer. However, nature lovers should make sure to visit in March. Poppies and wildflowers will make your daily hikes a delight. Unfortunately, none of these hidden gems are home to timeshare resorts. However, as they are so easily accessible, they are well worth visiting for a day or two! Talk to us today about the possibility of purchasing timeshare in this area—we have a vast trove of weeks available at fantastic prices.